[SatNews] Airbus Defense and Space has launched AuroraGlobal, able to provide unmatched high throughput MILSATCOM services to defense and other government customers, using the power of Skynet satellites and new developments in ground network infrastructure. 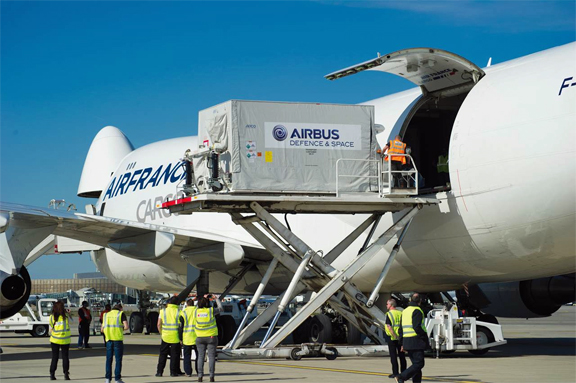 As part of the new offer, Airbus Defense and Space has demonstrated new X-band capabilities by delivering higher throughput via smaller terminals, including terminals already in operation. Test results in 2013 have proven that X-band is a highly capable bearer for the increasing requirements of governmental user demands. Airbus Defense and Space engineers achieved unprecedented results using the latest available small antenna and hardened Skynet satellites. Delivering more than 70Mbps (transmit and receive), using a 0.6-m terminal and the latest DVB-S2 modem technology, this opens up secure satcom options for comms-on-the-move ISR (Intelligence, Surveillance and Reconnaissance) operations, particularly in the UAV (Unmanned Aerial Vehicles) domain. “Airbus Defense and Space is at the highest level of satcom services technology. We continuously strive to improve the performance we deliver to customers, offering them the best value solutions available and providing unmatched next generation military satcom,” said Evert Dudok, Head of Communications, Intelligence & Security at Airbus Defense and Space. Separate tests of Airbus Defense and Space’s SCOT5 1.5 -m naval terminals, currently in service, confirmed that levels of assured throughput service could be achieved at four times the present levels provided to military satcom customers. These results demonstrate that X-band is a clear response to the operational needs of military users, whether occasional high data rate ISR or continuous operational communications. Airbus Defense and Space’s latest strategic partnerships with operators of complementary SATCOM capabilities – such as Inmarsat’s Global Xpress and Intelsat’s EpicNG—also provide customers with the maximum flexibility and assurance that they have access to the best-fit and future-proof high performance SATCOM services portfolio. Airbus Defense and Space currently operates the hardened Skynet military satellite constellation and the ground network to provide all Beyond Line of Sight (BLOS) communications to the UK Ministry of Defence. This Private Finance Initiative (PFI) also enables the company to provide Skynet-based communication services to armed forces from other countries including US, Canada and Australia, as well as to NATO. Additionally, DZZ-HR, the Republic of Kazakhstan’s first Earth observation satellite, has just left Airbus Defence and Space’s cleanrooms in Toulouse and is now on its way to the Guiana Space Centre in Kourou—from there, a European Vega launcher will place the satellite into orbit, with a launch date set for April 25, 2014. The DZZ-HR satellite being loaded for shipment to Kourou for launch. Photo courtesy of Airbus Defence and Space. DZZ-HR is a 900kg high-resolution satellite. From a low sun-synchronous orbit, it will provide the Republic of Kazakhstan with a complete range of civil applications, including monitoring of natural and agricultural resources, provision of mapping data, and support for rescue operations in the event of a natural disaster. Airbus Defence and Space signed a contract with Kazakhstan Gharysh Sapary (KGS) to supply the Government of the Republic of Kazakhstan with a space Earth observation system following an international tender process in 2009.